I help businesses nurture, manage and grow their brand communities online. Is membership stalling? Engagement a struggle? Or are you wondering how to even get a brand community started? I can help! Let's connect and think about the different ways in which you can structure, build and grow an online community experience that delights members from beginning to end while remaining profitable and sustainable for you. I'll use my training in communications, my experience in digital marketing and my passion for customer success to help you build the right community experience for your brand. Digital business builders who get the value of nurturing their waitlist, their customers and their community in a human-centered way. Brand communities and whether your business would benefit from having one. What makes or breaks an online brand community. How to get started with nurturing your brand community online. Your online brand community; whats working well and what isn't. Challenges with member growth and retention in your current brand community. Ideas and tactics to boost engagement. Designing a community experience that feels right and drives business results. Creating content and programming that delivers real value to members. Where to get started with building a brand community online. Making your brand community more profitable and/or sustainable. Building a team that can support your brand community. What to prioritize or cut out in the experience you offer. Automating and streamlining community management processes. 1️⃣I help you DEFINE the purpose of your community for both you and its members. That means going back to basics and getting clear on your purpose, your people, and your community's job description. 2️⃣I help you DESIGN the experience in your community based on the job description we defined. Whether you already have a community or you're just getting started, we spend time crafting an end-to-end community experience that feels sustainable for you and delivers high value for your members. 3️⃣I help you DEPLOY the experience we designed by aligning it to the right people, processes, and tools that will help you manage everything with ease. At every step, I strive to create an impact by staying curious, engaging with empathy, communicating actively and maintaining a commitment to problem-solving. I'm known for my abilities to ask great questions and communicate concepts that may feel complicated in simple terms. I also have a knack for translating business objectives into effective strategies that add value and create a positive human experience. My online journey started at the age of 16 when I first discovered Internet relay chat rooms. I instantly fell in love with the idea of being able to connect with people whom I likely wouldn't meet otherwise. From there, I took on several roles as a channel administrator, community moderator, website builder, app tester and an early adopter of many online platforms. Again and again, my passion for using technology to facilitate meaningful human connections was fuelled by the connections I was able to make. I now have over 18 years of experience in online communication, community building, and digital strategy. And I've had the pleasure of working with clients of all sizes – from multinational travel organizations to educational institutions to entrepreneurs and small businesses. As a speaker, I've shared my savvy with thousands of small business owners across North America. My work has also been featured in media outlets such as YFS Magazine, the Female Entrepreneur Association, the BizChix podcast, Mirasee, and PAX Magazine. 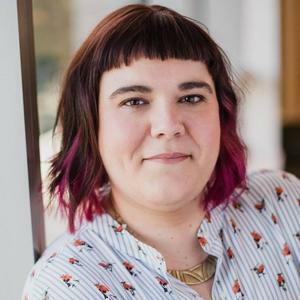 Christine Thatcher is a seasoned design pro but isn’t a mass marketer; her greatest strength lies in building personal connections with other designers. Her students are mostly independent or freelance designers who have a built-up tolerance to mass marketing tactics. What most of them really crave is connection and peer support. She needed a space of connection specifically for the designers on her list and beyond. This needed to be a place where designers of all levels could support one another and where Christine could demonstrate her knowledge and leadership. It also had to support Christine’s goals of selling Designing to Delight and her premium programs, be easy to manage and reduce her marketing load. I helped Christine build the Drama-Free Design Collective from scratch to support new designers and introduce the course by the same name. The community has since grown from 0 to 1,800+ members and generated over $126,000 in sales in less than 9 months. Within a year of launching a blog about emerging design trends in the textile industry, Michelle Fifis was receiving emails from like-minded designers who were curious about her process and wanted to know what she was working on. She decided to take the most common questions she was hearing from other designers and package them into a course – and Pattern Observer morphed from a blog into a designer resource community. Although her community was already active when we started working together, Michelle was struggling with getting more member sign-ups, marketing overload and having less and less time to focus on content and programming. Together, we identified where there was an opportunity to streamline, optimize and simplify. From there, we were able to design new promotional campaigns that took marketing pressure off, revamp the member interface to make community interaction easier and rethink some of her content and programming. As a result, we were able to generate a 10x increase in new memberships within 3 months and an 83% increase in net monthly growth over 6 months. I've been both interviewed and invited to contribute content to blogs, podcasts, and communities for over a decade. - Working with a distributed team and client base. In my spare time, I'm a street photographer and light painter. My work hangs in a few homes across North America and was featured alongside the work of my teachers and mentors in the juried art show at the 2016 PHOTOgraphie Festival. In the past 5 years or so, I've also developed a love for mixed media art. I love bold color, contrast, rich textures, and abstraction. I work primarily with acrylic paints, alcohol inks and collaging and I LOVE talking about all things art and creativity. Sophie hasn't received any reviews. How can you best start or keep growing your brand community? Let's hop on a call and find out! Then, let's assess whether or not I can help get you there. How can you start or keep growing your brand community on the right foot? We'll spend 90 minutes working 1:1 to explore your initial ideas and the outcomes you want to generate. I'll take notes, ask questions and provide valuable input to help you get clear on your best next steps. You'll walk away with actionable insights to help you optimize growth, boost engagement and/or improve the overall experience you offer. Wish you could bring a community expert in-house to consult with you and/or your team? Book me for a half a day (4 hours) to brainstorm, analyze, ideate or plan whatever you need related to growing or managing your brand community. We will discuss what you want to cover and co-create an agenda ahead of time. Then, we'll either meet in person (in the Greater Vancouver area) or via teleconference (Zoom) on our scheduled day. NOTE: Options are available if you want me to travel to your location outside of Vancouver. Please contact me to discuss. Wish you could bring a community expert in-house to consult with you and/or your team? Book me for a full day (8 hours) to brainstorm, analyze, ideate or plan whatever you need related to growing or managing your brand community. We will discuss what you want to cover and co-create an agenda ahead of time. Then, we'll either meet in person (in the Greater Vancouver area) or via teleconference (Zoom) on our scheduled day. NOTE: Options are available if you want me to travel to your location outside of Vancouver. Please contact me to discuss. Once you've written and sent your first 4-5 introductory email(s), I'll pop into your email marketing platform and put them together in a basic automated sequence that you can use to welcome new waitlist users in perpetuity. I'll work with Brett to provide the info he needs to connect all of this to the waitlist sign up process on your site.